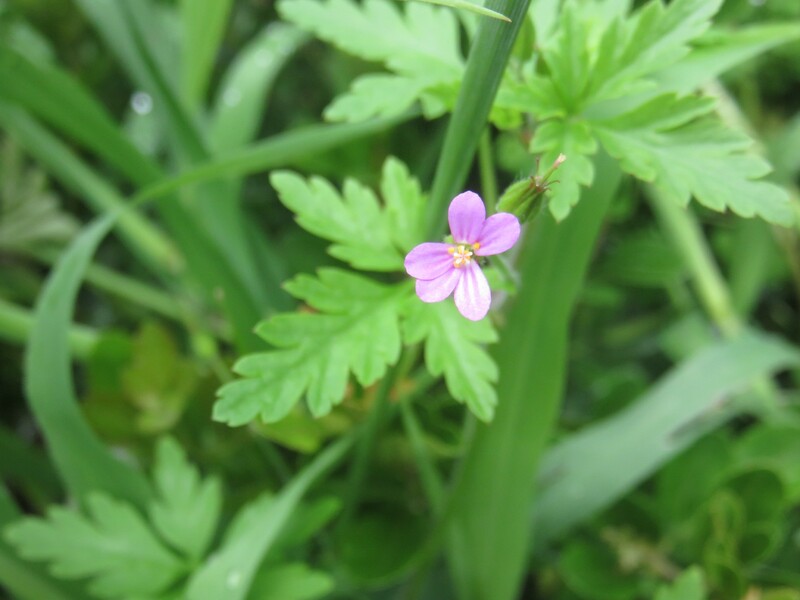 A so called weed, Geranium purpureum turns out to be one of the great healing herbs and plant companions. I used to weed it out of my garden, now I treasure it. Link to more info below. Recently I have embarked on a wonderful journey of discovery. It started with finding out more about our indigenous edibles and evolved into a more ominvorous foraging mindset. When you start to discover that the plants you walked past most of your life growing out of cracks in the pavement and in vacant plots are delicious delicacies brimming with vitamins and other nutrients, moving about the city does take on a new perspective. In the last few months I've found myself becoming more and more fascinated by plant chemistry and herbalism. My interest was spurred on by watching the wonderful series 'Remedy'. Having to deal with and heal from some some stress caused illnesses such as Meniere's Disease an suspected BPD has also been a motivator. I'm most interested in the intersection of nutrition, lifestyle and herbal remedies. This will keep you safer from so much more than vampires ! Garlic is a super herb for its wide spectrum of protection against degenerative disease. Link to garlic page below. I am not a qualified herbalist, just an exploring beginner, so please don't take my words as gospel, do your own research before consuming anything. I can not take any responsibility for the consequences, or or for misunderstandings made in the interpretation of my research articles. I have not reached the stage where I can vouch that any of this stuff actually works, and is not harmful. I'm just curious. The herbalists in the series 'Remedy' recommend that with a serious illness like cancer, requiring very strong therapy, mainstream medicine has a place, and it is in the integrated approach, or the use of both herbs and mainstream therapies that the best results are seen, better than both therapies alone. Herbal tonics help with managing the symptoms of chemotherapy and making a faster recovery they say. Some famous people they mention chose to only use herbs and are no longer with us. This was a warning from a lifetime natural nurse. When the herbalists themselves are confronted with such an illness many choose an integrated approach between modern medicine and the ancient craft of herbalism. I think a good illustration for the time being with my present grasp on the subject is the example of heart disease. Our heart problems may be caused or exacerbated by not taking enough exercise, by what we eat, or the quantities we eat, but when we reach the ER, it is too late for dieting, that comes once our lives are saved. Many healing herbs called adaptagens or tonics also work in the long term preventative capacity that good diet does. The benefit of many healing herbs is in small, careful and diligent administration over long periods. They are efficacious but cannot undo years of neglect, or help undo in a flash conditions that require serious medical emergency treatment. Food and the phytochemicals in plant foods can be used as preventative medicine. The plants you eat can also be seen as healing herbs, or nutritional medicine. Take a daily dish of raw food diversity. We've started assembling a plate like this every morning we have time, it takes about ten minutes. It sits on the desk next to the computer until we've snacked it all. This is how I get my husband and myself through our raw food quota. Reading on nutritional medicine has shown again and again that diverse, colorful and strong tasting food is everything, giving longevity and protection against the four big degenerative diseases, diabetes, dementia, heart disease and cancer. Today I brought home a lot of fruit from a local market. The bright colors indicate a wealth of anti oxidant properties. Oxidative stress by the free radicals we're exposed to daily is said to be the biggest cause of tissue damage but one anti oxidant in excess will not help you much, here diversity is also key. Each free radical may need a different anti oxidant, like a lock and key. Our body manufacture's some anti oxidants, but we need to take in others in our food to provide a full palette or arsenal. The more diverse our food sources the greater the range of anti oxidants we have as resources. There are even some in almonds.Anti oxidants are not the only phytochemicals in food that keep us strong, but they are very important. Nuts and dried fruit are highly calorific and weight loss if you are overweight, as I am, is fundamental to keeping your health and fighting off the big four degenerative disease too. The dried food should be in small quantities, as spoon each per day, maximum. You can eat the kiwi skin, its full of good fiber. Eat the food whole if you can, juicing is going to give you a fructose sugar bomb without the fibre and phytochemicals in the skins needed to compensate for that insult to your blood vessels, cells and pancreas. In the bowl is some olive oil mixed with oregano and thyme, all of which make for healthier blood lipids, and some home brewed vinegar. 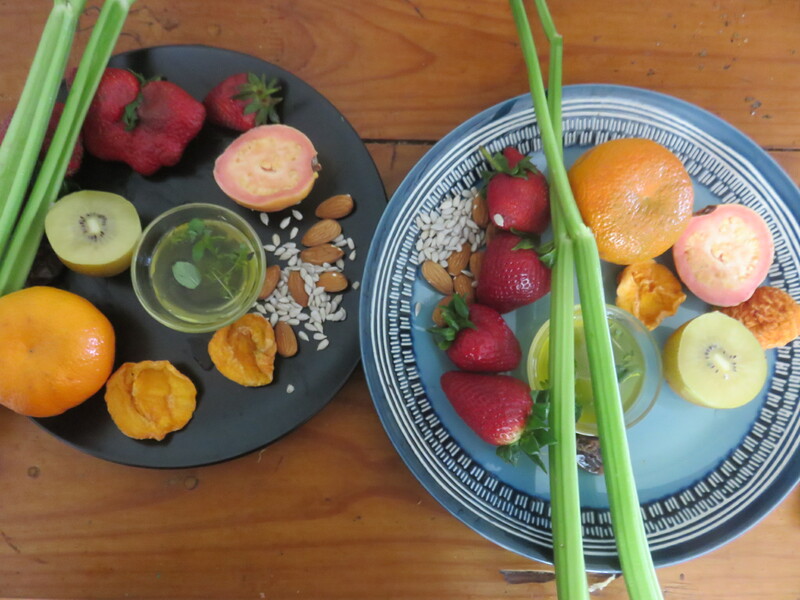 With the dried fruit and vinegar we have a little gut flora package too as home brewed vinegar contains lacto bacteria and a whole ecosystem of beneficial microbes, as does the skin of dried fruit.